Few brands can lay claim to the breadth and strength of Mercedes-Benz. The three-pointed star featuring on the grilles of everything from super-luxury saloons and high performance sports cars, to the bin lorry that collects your rubbish or the bus that takes your kids to school. With its Sprinter van it retains that upmarket cachet. And whether truly deserved or not, having that evocative badge on your working vehicle really is something to aspire to. As with rival vans, the Sprinter is offered in a wide variety of body styles, heights, weight, seating and cab arrangements. However the load space not quite as big as some rivals’ with the Sprinter, which shows the basic design of this van is beginning to age. That said, there should be something to suit every need with regular, high and super high roof specifications and seated minibus bodies. There are even specialist campers and 4x4 versions too for more specific requirements built by a number of specialists. The Sprinter has always had a reputation that lives up to its speedy name. Power came initially from a range of 2.1-litre four-cylinder and 3.0-litre V6 diesels with a choice of manual or automatic gearboxes - the auto being relatively rare. With Sprinters now as old as nine years, there’s plenty of choice out there. Prices start at under £3000 for huge mileage examples. So you can afford to be picky when it comes to mileages and specifications. Start-stop, dubbed Eco-Start was added in 2008 as an option, while 2009 saw the entire engine range overhauled with 95PS, 130PS and 165PS versions of the four-cylinder engine, and a single 190PS V6 3.0-litre option. The biggest change in the current Sprinter range’s lifecycle is the model refresh in April 2013, where it gained not just a new angular grille and headlights, but improvements to economy and emissions plus a refreshed interior as well as new harder-wearing upholstery. One of the Sprinter’s most common faults is problems with the diesel engine’s high pressure injection system. It’s called the ‘black death’ though it’s not as bad as is sounds if it’s caught early enough. The seals around the injectors go, causing a chuffing from under the bonnet. Put the heater and fan on in the cab and if there’s a faint smell of what should be coming out of the tailpipe then they’ll need looking at. A black build up around the injectors also highlights the issue. Depending on how bad it is, you could be looking at anywhere from £150 to £500 fix. Check the propshaft on any prospective purchase, they tend to fail at about 100,000 miles though they’re not too expensive provided you don’t source it from a dealer where they’ll charge around £800. For all other parts we'd suggest genuine only, particularly brakes. Servicing is around £250+VAT for a small service, to around £300+VAT for a larger one. Security isn’t a strong point, the Sprinter is easy to steal. You can't beat a traditional steering lock as a physical deterrent. Likewise catalytic convertors are often targeted by thieves for the metals in them. Again an aftermarket physical add on will make stealing them trickier - or at least send thieves looking elsewhere. Other niggles include check straps on the doors failing, sliding doors jamming and brake light switches failing - the latter confusing the ECU into thinking you’re braking when you’re not. There have also been a few recalls for fuel leaks. With Sprinters now as old as nine years, there’s plenty of choice out there. Prices start at under £3000 for massive-mileage examples, though you won’t be short of choice so you can afford to be picky when it comes to mileages and specifications. "If there’s a supercar of the van world, it’s the Mercedes-Benz Sprinter. It offers performance, power and economy, so it has the jump on more orthodox supercars, and it can also carry plenty of equipment or cargo in its generous load bay. It’s a very wise choice for any other van buyer thanks to Mercedes-Benz vast choice of different configurations. 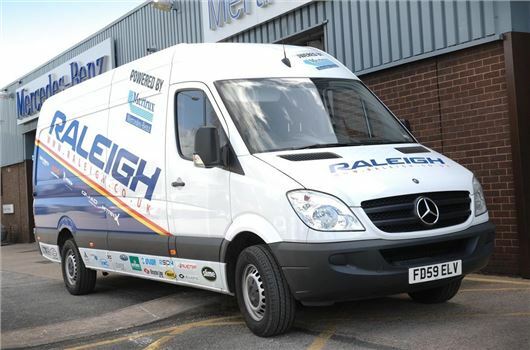 There are different wheelbases, body lengths, roof heights, weights and specifications to pick from, giving the customer the opportunity to pick the van they really want and need." The oil filter within the engine of 2007 Sprinters can become blocked and this causes the engine oil to be expelled through the dipstick hole (even though the dipstick is in place) leaving the engine to seize. Sprinters have a bit of a reputation for rust, though it’s unfair and largely down to abuse from owners - and unlined load spaces. Best advice regarding the bodywork is if it’s scratched or dinged, get some touch-up on it quickly - the Mercedes-Benz warranty is very particular in its cover regarding surface rust. As with any vehicle though they’re not perfect, one of the most visible problems being their tendency to rust. Bear puts this down to abuse, and the amount of operators running them without ply linings inside, though lots also attribute the Sprinter’s pockmarks to thin, water-based paints. Best advice regarding the bodywork is if it’s scratched or dinged, get some touch-up on it quickly, Mercedes-Benz’s warranty very particular in its cover regarding surface rust. Propshafts can break on higher mileage or abused examples, ask when, if ever, it’s been replaced. Driver’s seat wear will be replaced by Mercedes-Benz as a warranty item, so if it’s nearing the end of its warranty period and the seat’s needing attention then get down to your dealer. Tony Bear, owner of Mercedes-Benz Sprinter specialists A J Bear Motors in Romford, says the Sprinter is a favourite among those needing a robust van. "They have a reputation for strength and cope well with the abuse the typical van driver gives them. They’re certainly robust," he adds.